Made out of the finest quality of fibre available at our premises we have been ardently engaged in delivering a robust series of Bag Tags. These Bag Tags are made of PVC Rubber . 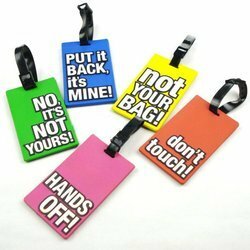 Product Description: Keeping the track of latest happening of this domain, we present clients with the premium quality of Soft Rubber Luggage Tag. Our rich industry experience in this field enabled us to provide a wide range of Rubber Tag to our reputed clients at reasonable prices. The unmatched finish and excellent quality of this tag makes it the preferred choice of our clients. 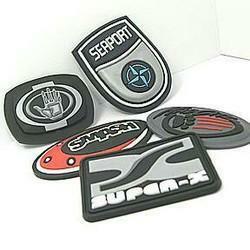 These rubber labels are made using premium quality rubber and can easily be attached or stitched. These rubber labels are available in varied lengths, thicknesses, shapes and designs. Our labels are light in weight and available at industry leading prices.